As we all know, a summer in North San Diego County without air conditioning can make for some very miserable rides home. 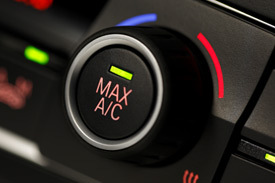 At Metro Transmission and Automotive, we can keep the inside temperature of your vehicle comfortable with our heating and air conditioning services. We have the technology and equipment available to detect any leaks or blockages in your heating and air system, and we have the experience to replace or repair any defective parts. With over 30 years of experience, we have the skills needed to ensure the manufacturer recommendations are met when repairing or replacing any of the elements of your heating and air conditioning unit. Once we have inspected all elements associated with the heating and cooling system, we determine which, if any, parts need to be replaced. We will provide you with a quote on those parts and labor, and our ASE certified mechanics will replace or repair the parts. We follow all manufacture recommendations when replacing or repairing your heating and cooling elements. Once the damaged parts have been fixed we can recharge your system with the proper freon to the required amount. After the repairs and recharge are complete, we perform a full heating and AC test to ensure your system is working to the optimum level. We also offer a premium A/C service that can remove any unwanted odors coming from your vents from internal rust and mold. With this service we use an evaporator deodorizer to remove the smell, and replace your cabin air filter to ensure you and your passengers are breathing in the cleanest air possible!